My 7 year old daughter is a bit of a cook book collector. She can often be found browsing the children section of cookbooks in our local library. She loves to pick out new recipes to try and she loves to help cook. This works out great for all of us because it opens up a world of new recipes to explore, new ingredients, and it even opens dialog about geography and history (depending on the cookbook). This week, Bella chose Tiana's cookbook from the Disney Princess and the Frog. On page 26 we found a recipe for Jammin' Jambalaya and that is where we decided to start cooking, but with a few of our own variations. 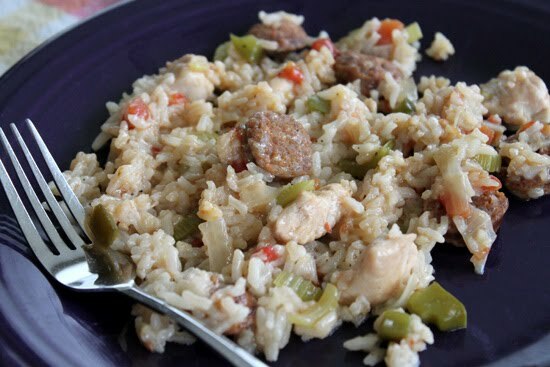 First, cook chicken and sausage, then add all ingredients, raise heat to a boil. Cover and reduce heat to low, simmering for aprox 20 minutes (or until rice is done). This was a huge hit with everyone. We only modified it slightly, but I have already decided to add way more vegetable with the next run, and maybe skip the sausage (I am not a huge sausage fan). Still, everyone enjoyed it and it did pack a little heat. This large serving is said to feed 6-8, and I believe it! Just add a salad and you're good to go! Check out the cookbook, here and look at your local library or bookstore for more fun children themed cookbooks to spice up your kitchen repertuar.